2009 APPLICATION NOW AVAILABLE ! HOW TO APPLY: Please note that acceptance to the School Garden Program, unlike most workshops at OAEC, is by application only. Please download BOTH the Application and the Instructions. If your school applied previously and would like to reapply, please contact us so we may retrieve your application from the waiting list and update as needed. DEADLINES: Application for all sessions must be received by email by March 31, 2009 at 5:00 pm. We will contact you by April 15 regarding the status of your application. CALIFORNIA INSTRUCTIONAL SCHOOL GARDEN GRANT: Funding from the California Instructional School Garden Grant program (AB1535) will expire June 2009. Public schools that received funding under this grant in 2008 can use any remaining funds to attend our professional development workshop in the summer of 2009. For further information about the program or on AB1535 funding, please contact Lisa Preschel, School Garden Program Director at 707-874-1557 ext 202 or lisa@oaec.org. OAEC’s School Garden Program, housed at our 80-acre site in western Sonoma County, has trained over 400 teachers, principals and core parent volunteers in 137 school garden programs in Northern California, the Greater Bay Area, and beyond. The core of OAEC’s Program is the five-day residential summer training which offers an array of skills and techniques focused on the instructional school garden, and its integration into multiple subject areas using experiential learning. 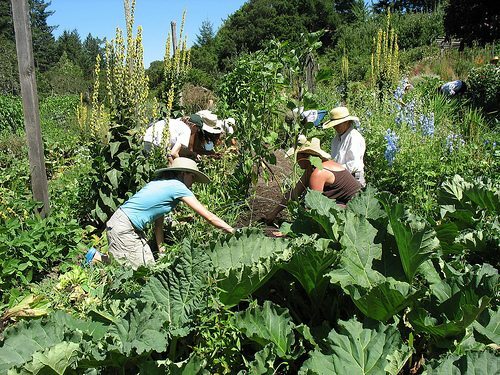 Through a combination of lecture, resource materials and hands-on sessions we teach participants organic gardening, permaculture, nutrition, garden design, team building, fundraising, art in the garden, and more.